Seventeen year-old Ruby, long-pledged to the much older Stiles from the Fireseed desert cult, escapes with only a change of clothes, a pouch of Oblivion Powder and her mute little brother, Thorn. Arriving at The Greening, a boarding school for orphaned teens, she can finally stop running. Or can she? The Greening is not what it seems. Students are rampaging out of control and as she cares for the secret Fireseed crop, she experiences frightening physical changes. She’s ashamed of her attraction to burly, hard-talking Blane, the resident bodyguard, and wonders why she can’t be happy with the gentler Armonk. She’s long considered her great beauty a liability, a thing she’s misused in order to survive. And how is she to stop her dependence on Oblivion to find a real beauty within, using her talent as a maker of salves, when she has nightmares of Stiles without it? When George Axiom, wealthy mogul of Vegas-by-the-Sea offers a huge cash prize for the winner of a student contest, Ruby is hopeful she might collect the prize to rescue her family and friends from what she now knows is a dangerous cult. But when Stiles comes to reclaim her, and Thorn sickens after creating the most astonishing contest project of all, the world Ruby knows is changed forever. This romantic fantasy set in 2099 on earth has a crafty heroine in Ruby, and a swoonworthy cast, which will surely appeal to both YA and a general audience. Ruby’s Fire, a YA finalist in the Next Generation Indie awards and an Amazon bestseller, is the companion book to Fireseed One, but can be read as a standalone. "With an astounding creativity and unique world-building, Catherine Stine created a futuristic adventure that will surely keep you turning the pages until you beg for more." -Books for YA! 5 stars from The (Mis) Adventures of a Twenty-Something Year-Old Girl: "You know when you get a book, and it's much better than you thought it was going to be? Ruby's Fire was definitely one of those books! I absolutely loved it... What an amazing plot! Also, there is a fantastic twist that I didn't see coming." Books for YA: "Astounding creativity and unique world-building." Words Create Scenes: "I can't even begin to tell you how smoothly the writing flows. It's perfect. No joke. I went into this book not knowing what to expect and what I got was an amazing storyline." Seeing Night Reviews: "Romance, betrayal, secrets, great world-building!" YA Between the Lines: "With the rest of her world coming down around her, Ruby must choose. Blane or Armonk? Blissful Oblivion or painful memories? Ruby can choose to wield her inner fire, but she has to be careful not to get burned." 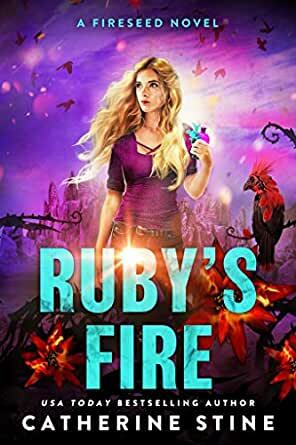 Book Luvver: "Ruby's Fire combines beautiful, arresting language with fully fleshed-out characters, a richly detailed post-apocalyptic setting, and fast-paced, surprising story turns." Fluttereal Flight: "Full of creativity, imagination & original concepts." 5.0 out of 5 starsAs good, if not better than first Firseed book. Another stand alone novel, this book tells more about the amazing Fireseed. At first, I was slightly disappointed as it didn't immediately pick up where the first book left off. But, it didn't need to. This part of the saga introduces new characters to love and hate, as well as occasional, appearances from previous people in the first novel. It continues to have new and unique ideas which just whet the appetite for more. Enjoy. I picked up a copy of this from a book rebel email. Nice cover, the story sounded interesting. I didn't get a chance o start reading it until that night. Once I did I couldn't put the book down as they say. I didn't even realize until after I finished the book that it was actually a book 2 so I'll have to go back and read book 1 next. 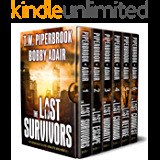 Ruby and her younger, mute brother, Thorn, are children of the post apocalyptic future—long after quakes have shifted earth’s geography and separated people into isolated regions. Each living group has its issues and beliefs, but one thing they share is an abundance of heat, so much that they can only venture outside with special heat protective gear. There’s little animal life and the only plant is the sacred Fireseed that thrives in the desert the world has become. When Ruby’s driven to flee from the safety of her house in order to escape a particularly vile man, she and Thorn risk death, but find a safe haven at a school instead. Only there are dangers there, too. Not everyone welcomes the newcomers. Then an urbanized settlement holds a contest to see who can develop a use for Fireseed that’s the most beneficial to mankind. Ruby and the others at the school see it as a chance to improve their lives and perhaps the lives of others in their own regions. As the characters work on their projects for this contest, the talents of some of these young refugees are revealed. At the same time the ugliness of others, including the creators of the contest come to light. This contest also alters Ruby’s and Thorn’s lives forever. I enjoyed discovering the world of Fireseed, its desolation, and then the promise of life’s slow return to earth. It would be a different kind of life, but it was exciting in its possibilities. For me the story kicked in after Thorn attempted to “heal” the Fireseed with sun. From then, through the contest and into the final scene, I needed to read. That meant I was truly engaged in the book. It's a great read for a young adult, and I'll be recommending it to those readers in my family. 5.0 out of 5 starsJust because this is YA does not mean it is not powerful and thought-provoking. Dystopian with scifi and romantic elements and real threat. The ending may have been a little too easy, but still, a very good book with heart. 5.0 out of 5 starsCouldn't put it down. Every time I start reading one of Stine's novels, I tell myself I'll just read a chapter before bed, then I stay up reading the next chapter and the next after that. Ruby's Fire was no exception. I immediately cared about Ruby and her little brother Thorn and it was hard to stop reading when they seemed always in the middle of the next crisis or the next exciting moment. I was pleased to get some resolution about what happened to Verik, and to see the development of the hybrid theme work in such an interesting way. Ruby's voice throughout is strong and engaging. This book can easily stand on its own, but I recommend reading Fireseed first. Into only the first page, I was thinking that I might not like it because of its futuristic bent which is usually not my cup. Happy to say I was wrong and kept right on reading it. This is a captivating book with imaginative creatures and interesting characters and the plot is curiously devised. It's a little simplistic which probably makes for good YA fiction. Loved the illustrations too. Good job, Ms. Stine.